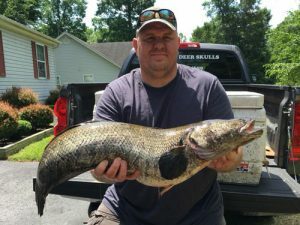 A Maryland bowfisherman recently set a state record for northern snakehead. On May 24, Andrew “Andy” Fox of Mechanicsville took the record setting snakehead from Mattawoman Creek in Charles County. Fox and two friends where on an overnight bow fishing trip when the northern snakehead was encountered. Fox caught a glimpse of a fish illuminated in the glare of the boat’s lights. Thinking it may be carp, Fox said he was slow to respond, but after a few seconds determined that it was a snakehead. “That’s the biggest snakehead I’ve ever seen,” said Fox. Removing the arrow, Fox said, “This might be a new state record.” In fact, it is now the biggest northern snakehead caught in the state of Maryland invasive species division. Fox’s snakehead was officially weighed and certified by the Maryland Department of Natural Resources and Gray Brothers Market. The record-breaking northern snakehead tipped the scales at 19.9 pounds with a length of 35.157 inches, breaking the 2-year-old record of Dutch Baldwin’s 18.42 pound catch in May 2016. Fox plans to have his record breaking northern snakehead mounted for display. Northern snakeheads are considered an invasive species in Maryland. Current regulations prohibit the importation, possession and transporting of live snakeheads. Anglers are encouraged to catch-and-harvest snakeheads immediately or to release them back in the exact location they were found. There is no minimum size or creel limit, and they can be harvested year-round. To learn more, visit the Maryland DNR invasive species page.